As views of the economy improve and terrorist threats persist, the public’s policy priorities have changed: For the first time in five years, as many Americans cite defending the U.S. against terrorism (76%) as a top policy priority as say that about strengthening the nation’s economy (75%). Since Barack Obama began his second term in January 2013, the economy has declined 11 points as a top priority, and improving the job situation has fallen 12 points (from 79% to 67%). There has been little change over the past two years in the number saying that defending against terrorism should be a top priority; in fact, this has consistently been among the public’s leading policy goals since 2002. But it has moved to the top of the priorities list as the economy and jobs have fallen. The Pew Research Center’s annual policy priorities survey, conducted Jan. 7-11 among 1,504 adults, also finds that the goal of strengthening the military has increased in importance. Currently, 52% say strengthening the military should be a top policy priority for the president and Congress this year, up from 41% in January 2013. While there have been increases since 2013 in the percentages of both Republicans (from 58% to 71%) and Democrats (from 31% to 41%) rating a stronger military as a top priority, this is now a leading goal for Republicans. It now ranks close to the economy, jobs and the budget deficit among Republicans’ top priorities. 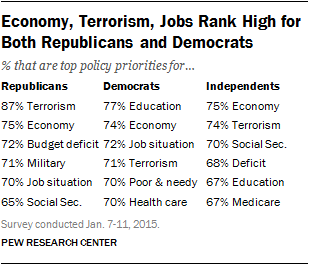 Terrorism by a wide margin ranks first among Republicans (87%). The survey finds little change over time in many of the public’s other priorities: 67% rate improving education as a top priority, 66% cite securing Social Security, 64% reducing health care costs and 61% securing Medicare. However, the budget deficit – which surged in importance between 2009 and 2013 – has lost ground since then. Currently, 64% say reducing the budget deficit is a top priority; that is little changed from last year (63%), but down eight points since 2013. At the same time, other priorities are now viewed as more important. 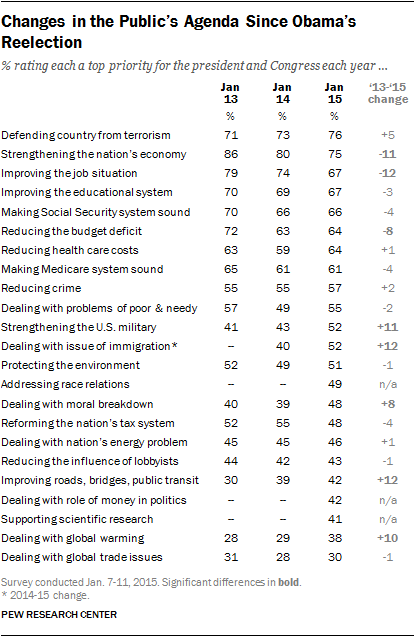 Increasing percentages say improving the nation’s infrastructure (up 12 points since 2013), dealing with global warming (up 10 points) and dealing with the nation’s moral breakdown (eight points) should be top priorities. Immigration, for which there is no 2013 trend point, has grown as a priority since last year; 52% view it as a top priority, compared with 40% last January. The public’s diminished focus on economic priorities comes as perceptions about the state of the economy and the availability of jobs have turned more positive. And while the recent terrorist attacks in Paris did not result in a major increase in worries about a possible attack soon in this country, there has been growing concern over Islamic extremism, both in the United States and overseas. A poll in September, as the threat from ISIS emerged, found 53% saying they were very concerned about the rise of Islamic extremism in the U.S., up 17 percentage points2011. As President Obama prepares for his Jan. 20 State of the Union, the public overwhelmingly thinks it is more important for him to focus on domestic policy than foreign policy. Two-thirds (67%) say it is more important to focus on domestic policy, compared with 20% who want him to focus on foreign policy. However, the share who rate foreign policy as more important has roughly doubled in the past year, from just 9% on the eve of Obama’s last State of the Union. As previous policy priority surveys have found, there are huge partisan differences over the importance of many goals, but also areas of common ground. As in the past, some of the largest partisan gaps are over the environment, dealing with the poor and strengthening the military. 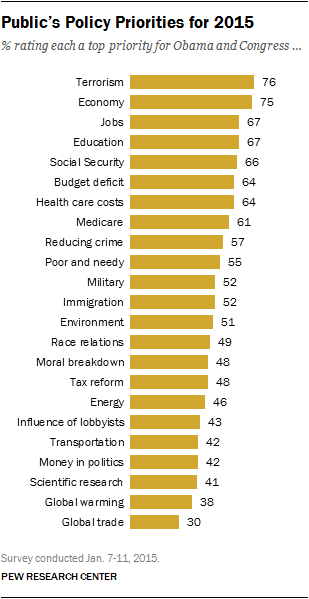 The partisan divide over dealing with global warming is especially striking: 54% of Democrats view this as a top priority for the president and Congress compared with just 15% of Republicans. Democrats also are 31 points more likely than Republicans to prioritize protecting the environment (66% of Democrats vs. 35% of Republicans) and 30 points more likely to rate dealing with the problems of the poor and needy as a top goal. By contrast, while 71% of Republicans say that strengthening the military should be a top priority, just 41% of Democrats agree. Still, Republicans and Democrats are in synch on the importance of a number of goals. Comparable percentages in both parties view such items as strengthening the economy, improving the job situation and securing Social Security and Medicare as top policy priorities. Defending against terrorism, strengthening the economy and improving the job situation rank among the leading priorities for both Republicans and Democrats. But strengthening the military and reducing the deficit rate as more important for Republicans than Democrats, while improving education and dealing with the problems of the poor rank higher for Democrats than Republicans. 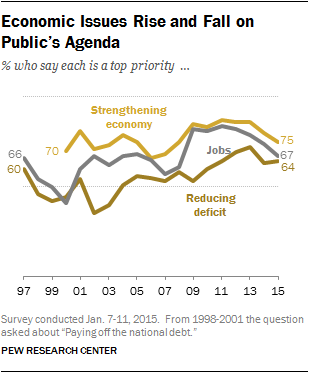 Strengthening the economy has been among the public’s leading policy goals since the Pew Research Center began asking the question in 2000. The share citing the economy as a top priority increased during the recession, before declining over the past two years. Similarly, the percentage saying improving the job situation should be a top priority increased as the economy worsened – from 57% in 2007 to 82% in 2009. It remained at about 80% through 2013, and has fallen 12 points since then to 67%. The decline in the importance of improving the job situation has been particularly striking among those with higher incomes. 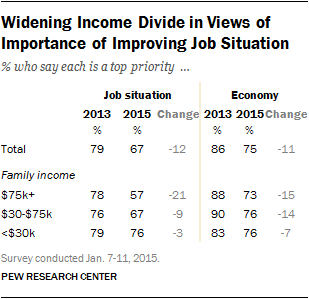 In 2013, 78% of those with family incomes of $75,000 or more said that improving the job situation was a top priority for the president and Congress. Nearly identical shares of those with lower incomes also viewed this as a top goal: 76% of those with family incomes of $30,000-$75,000 and 79% among household earning less than $30,000. Since then, jobs have fallen 21 points as a top priority among those with incomes of at least $75,000 (57%), and 9 points among those with incomes of $30,000 to $75,000 (67%). But there has been virtually no change among those with incomes of less than $30,000; 76% in this category still see jobs as a top priority, which is 19 points higher than those with incomes of at least $75,000. The pattern is similar, though less pronounced, in views of the economy. Meanwhile, the percentage of Americans who say that reducing the budget deficit should be a top priority for the president and Congress rose 19 points between 2009 and 2013, but has fallen eight points over the past two years. Pew Research Center surveys have found that, historically, the party holding the White House tends to place less importance on reducing the deficit compared with the party out of power. That remains the case today, with 72% of Republicans and 55% of Democrats rating deficit reduction as a top policy priority. But the share of Republicans who say that reducing the deficit should be a top priority has fallen 12 points (from 84%) since 2013. 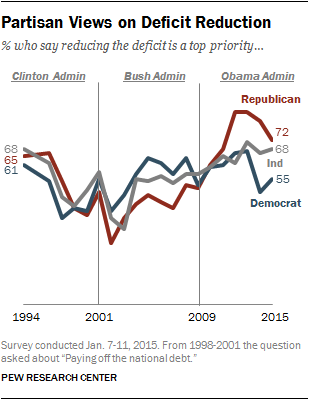 Among Democrats, deficit reduction declined from 67% in 2013 to 49% in 2014, before recovering slightly this year. Currently, 51% say that protecting the environment should be a top priority for the president and Congress this year, which is little changed over the past two years. The percentage of the public rating environmental protection as a major policy goal hit a high point of 63%, after George W. Bush’s election, and fell to about 40% in Obama’s first years in office. As with nearly all of the 24 priorities asked about, most Americans give at least some priority to environmental protection. While 51% rate it as a top priority, another 37% say it is an important but lower priority; just 11% say it is not toot important or should not be done. However, this is not the case with views of the importance of dealing with global warming. Nearly four-in-ten (38%) say it should be a top priority, 29% see it as an important but lower priority, while 31% say it is not too important or should not be done. 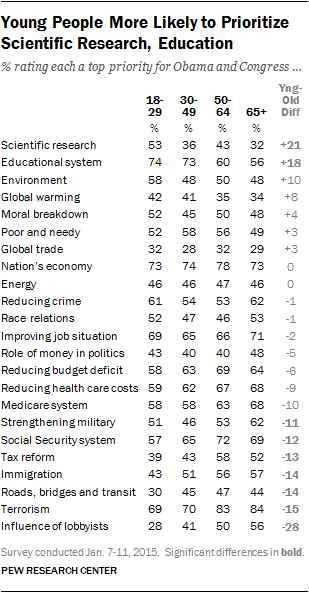 Opinions about the importance of both priorities, but especially global warming, are divided along partisan lines. Since 2013, the share saying that dealing with global warming should be a top priority has increased 16 points among Democrats (38% to 54%) and ticked up eight points among independents (31% to 39%). Just 15% of Republicans rate this as a top priority, while 21% view it as an important but lower priority. 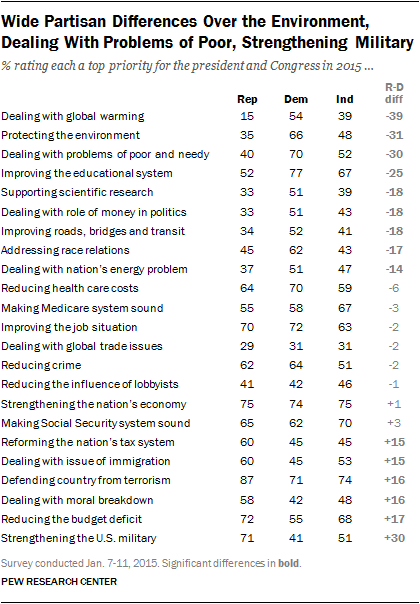 A majority of Republicans say dealing with global warming is not too important (31%) or should not be done (also 31%). 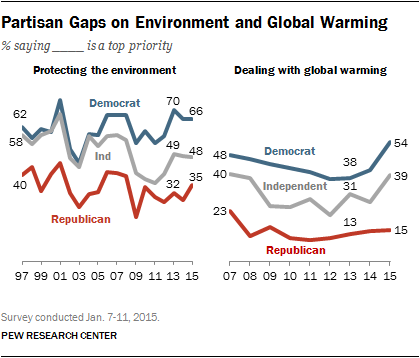 Partisan differences over the importance of protecting the environment are not as stark. Two-thirds of Democrats (66%) and 35% of Republicans rate this as a top priority. Most members of both parties (94% of Democrats and 82% of Republicans) say it is either a top priority or an important but lower priority. For the most part, there are only modest differences in the policy priorities across age groups. But those younger than 30 are much more likely than those 65 and older to say that supporting scientific research and improving the educational system should be top priorities. Older Americans, by contrast, attach more importance than younger Americans to several policy objectives – including defending against terrorism (84% vs. 69%), and securing Social Security (69% vs. 67%). The age differences are especially large when it comes to reducing the influence of lobbyists and special interests in Washington. Twice as many adults 65 and older (56%) compared with those under 30 (28%) view reducing the influence of lobbyists as a top priority.